It’s an ingredient that you can easily find in your supermarket and health food store. Eat it for more than 2 months, and you’ll have drastic reduction in blood pressure. Recent research published in the journal Hypertension has shown that probiotics are just the thing to help you lower your blood pressure. Probiotics are live bacteria and yeasts that are good for your health, both for your digestive system and immune system. We usually think of bacteria as something that causes diseases. But your body is full of bacteria, both good and bad. Probiotics are often called “good” or “helpful” bacteria because they help keep your gut healthy. Good bacteria are naturally found in your body. You can find probiotics in fermented foods, such as yogurt, cheese, sauerkraut, miso soup and pickles. Can Probiotics Cause a Drastic Reduction in Blood Pressure? This research on the link between probiotics and blood pressure analysed data from nine different studies involving 543 participants with normal and high blood pressure. 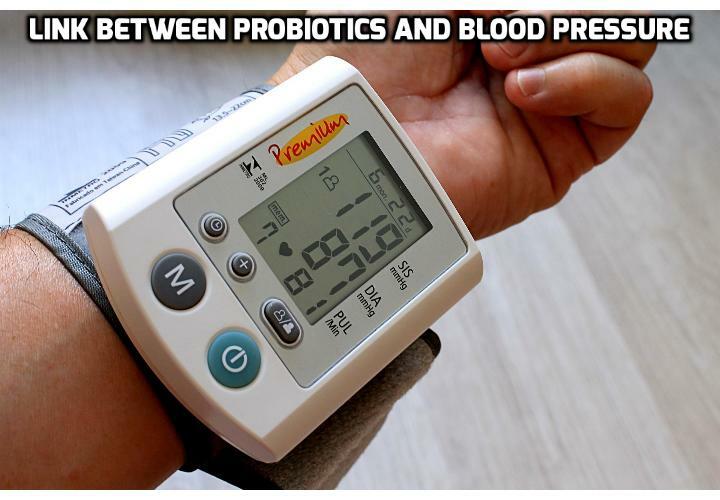 Those who consumed probiotics regularly showed an average reduction in blood pressure of 3.6 mm Hg systolic pressure and 2.4 mm Hg diastolic pressure compared to those who didn’t. The most important factor was the duration of consumption of the probiotics. When consumed for less than 2 months, no significant difference was observed. When consumed for a longer period, probiotics were found, in addition to improve blood pressure, to lower LDL cholesterol and blood sugar levels. Probiotics’ benefits seemed greatest among people with elevated blood pressure (higher than 130/85), and probiotics with multiple types of bacteria lowered blood pressure more than those with a single type of bacteria, the researchers reported. If improving your heart health means including a probiotic product in your diet every day, isn’t it worth the effort? How to Use Probiotics Safely? The FDA regulates probiotics like foods, not like medications. Unlike drug companies, makers of probiotic supplements don’t have to show their products are safe or that they work. Ask your doctor for more information about the correct product and dose for you. In general, probiotic foods and supplements are thought to be safe for most people, though some people with immune system problems or other serious health conditions shouldn’t take them. Talk to your doctor first to make sure they’re OK for you. In some cases, mild side effects might include upset stomach, diarrhoea, gas, and bloating for the first couple of days after you start them. They may also trigger allergic reactions. Stop taking them and talk to your doctor if you have problems. And, of course, the best way to get your heart health on track is to lower your blood pressure. Start lowering your blood pressure today with just these 3 easy, simple exercises. Take a look, right here! Next PostNext Do blood pressure medications increase breast cancer risk?